A viral infection model with a nonlinear infection rate is constructed based on empirical evidences. Qualitative analysis shows that there is a degenerate singular infection equilibrium. Furthermore, bifurcation of cusp-type with codimension two (i.e., Bogdanov-Takens bifurcation) is confirmed under appropriate conditions. As a result, the rich dynamical behaviors indicate that the model can display an Allee effect and fluctuation effect, which are important for making strategies for controlling the invasion of virus. where susceptible cells ( ) are produced at a constant rate , die at a density-dependent rate , and become infected with a rate ; infected cells ( ) are produced at rate and die at a density-dependent rate ; free virus particles ( ) are released from infected cells at the rate and die at a rate . Recently, there have been many papers on virus dynamics within-host in different aspects based on the (1.1). For example, the influences of spatial structures on virus dynamics have been considered, and the existence of traveling waves is established via the geometric singular perturbation method . For more literature, we list [3, 4] and references cited therein. As for this model, it is easy to see that the basic reproduction number of virus is given by , which describes the average number of newly infected cells generated from one infected cell at the beginning of the infectious process. Furthermore, we know that the infection-free equilibrium is globally asymptotically stable if , and so is the infection equilibrium if . Here, denotes the infectious dose at which of the susceptible cells are infected, measures the slope of the sigmoidal curve at and approximates the average number of virus that enters a single host cell at the begin stage of invasion, measures the infection force of the virus, and measures the inhibition effect from the behavioral change of the susceptible cells when their number increases or from the production of immune response which depends on the infected cells. In fact, many investigators have introduced different functional responses into related equations for epidemiological modeling, of which we list [12–17] and references cited therein. However, a few studies have considered the influences of nonlinear infection rate on virus dynamics. When the parameter , [18, 19] considered a viral mathematical model with the nonlinear infection rate and time delay. Furthermore, some different types of nonlinear functional responses, in particular of the form or Holling-type functional response, were investigated in [20–23]. where . Note that is the average life time of susceptible cells and is the average life-time of infected cells. Thus, is always valid by means of biological detection. If , the virus does not kill infected cells. Therefore, the virus is non cytopathic in vivo. However, when , which means that the virus kills infected cells before its average life time, the virus is cytopathic in vivo. The main purpose of this paper is to study the effect of the nonlinear infection rate on the dynamics of (1.6). We will perform a qualitative analysis and derive the Allee-type dynamics which result from the appearance of bistable states or saddle-node state in (1.6). The bifurcation analysis indicates that (1.6) undergoes a Bogdanov-Takens bifurcation at the degenerate singular infection equilibrium which includes a saddle-node bifurcation, a Hopf bifurcation, and a homoclinic bifurcation. Thus, the nonlinear infection rate can induce the complex dynamic behaviors in the viral infection model. The organization of the paper is as follows. In Section 2, the qualitative analysis of system (1.6) is performed, and the stability of the equilibria is obtained. The results indicate that (1.6) can display an Allee effect. Section 3 gives the bifurcation analysis, which indicates that the dynamics of (1.6) is more complex than that of (1.1) and (1.2). Finally, a brief discussion on the direct biological implications of the results is given in Section 4.
which describes the average number of newly infected cells generated from one infected cell at the beginning of the infectious process as zero. Although it is zero, we will show that the virus can still persist in host. We start by studying the equilibria of (1.6). Obviously, the infection-free equilibrium always exists and is a stable hyperbolic node because the corresponding characteristic equation is . (iii) there are two infection equilibria and if . is a Saddle-Node bifurcation surface, that is, on one side of the surface system (1.6) has not any positive equilibria; on the surface system (1.6) has only one positive equilibrium; on the other side of the surface system (1.6) has two positive equilibria. The detailed results will follow. Since in this case, is valid. Thus, and the equilibrium is a saddle. By a similar argument as above, we can obtain that . Thus, the equilibrium is a node, or a focus, or a center. We have the following results on the stability of . (iii) is a linear center if . which means that is a monotone decreasing function of variable . This means that . Thus, under the condition of and the sign of , is always valid if . When , if , if , and if . For (1.6), its asymptotic behavior is determined by the stability of if it does not have a limit cycle. Next, we begin to consider the nonexistence of limit cycle in (1.6). which is negative if . Hence , we can obtain the following result. The combination of (2.24) and (2.26) yields (2.20). are equivalent to . Consequently, we have the following. Thus, is a degenerate singular point. Since its singularity, complex dynamic behaviors may occur, which will be studied in the next section. In this section, the Bogdanov-Takens bifurcation (for short, BT bifurcation) of system (1.6) is studied when there is a unique degenerate infection equilibrium . Note that (3.1) and (1.6) are -equivalent; both systems have the same dynamics (only the time changes). Then, after some transformations, we have the following result. The equilibrium of (1.6) is a cusp of codimension if (H1) and (H2) hold; that is, it is a Bogdanov-Takens singularity. where , , are smooth functions in at least of the third order. This implies that the origin of (3.3), that is, of (1.6), is a cusp of codimension by in [25, Theorem , Section ]. , , are smooth functions in variables at least of the third order, and the coefficients depend smoothly on and . is smooth function in variables at least of order three, and all the coefficients depend smoothly on and . and is smooth function of , and at least of order three in variables . By the theorem of Bogdanov in [26, 27] and the result of Perko in , we obtain the following local representations of bifurcation curves in a small neighborhood of the origin (i.e., of (1.6). there is a homoclinic-loop bifurcation curve HL . Concretely, as the statement in [28, Chapter ], when , the orbital topical structure of the system (3.26) at origin (corresponding system (1.6) at ) is shown in Figure 1. The bifurcation set and the corresponding phase portraits of system (3. 26) at origin. Note that most infection experiments suggest that the infection rate of microparasitic infections is an increasing function of the parasite dose, usually sigmoidal in shape. In this paper, we study a viral infection model with a type of nonlinear infection rate, which was introduced by Regoes et al. .
Qualitative analysis (Theorem 2.1) implies that infection equilibrium is always stable if the virus is noncytopathic, , or cytopathic in vivo but its cytopathic effect is less than or equal to an appropriate value, . When the cytopathic effect of virus is greater than the threshold value, , the stability of the infection equilibrium depends on the value of parameter , which is proportional to the birth rate of susceptible cells and is in inverse proportion to the infectious dose . The infection equilibrium is stable if and becomes unstable if . When gets to the critical value, , the infection equilibrium is a linear center, so the oscillation behaviors may occur. If our model (1.6) does not have a limit cycle (see Theorem 2.2 and Corollary 2.3), its asymptotic behavior is determined by the stability of . When is stable, there is a region outside which positive semiorbits tend to as tends to infinity and inside which positive semi-orbits tend to as tends to infinity; that is, the virus will persist if the initial position lies in the region and disappear if the initial position lies outside this region. Thus, besides the value of parameters, the initial concentration of the virus can also affect the result of invasion. An invasion threshold may exist in these cases, which is typical for the so-called Allee effect that occurs when the abundance or frequency of a species is positively correlated with its growth rate (see ). Consequently, the unrescaled model (1.5) can display an Allee effect (see Figure 2), which is an infrequent phenomenon in current viral infection models though it is reasonable and important in viral infection process. Illustrations of the Allee effect for (1. 5). Here, . is stable, is a saddle point, is stable. 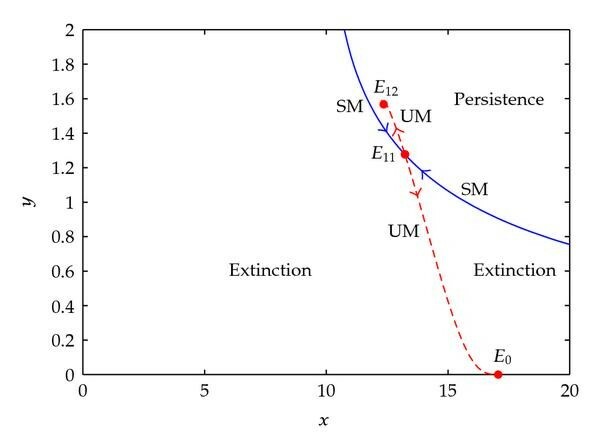 Note that SM is the stable manifolds of (solid line), UM is the unstable manifolds of (dash line), and the phase portrait of (1.6) is divided into two domains of extinction and persistence of the virus by SM. Furthermore, when infection equilibrium becomes a degenerate singular point, we have shown that the dynamics of this model are very rich inside this region (see Theorems 3.1 and 3.2 and Figure 1). 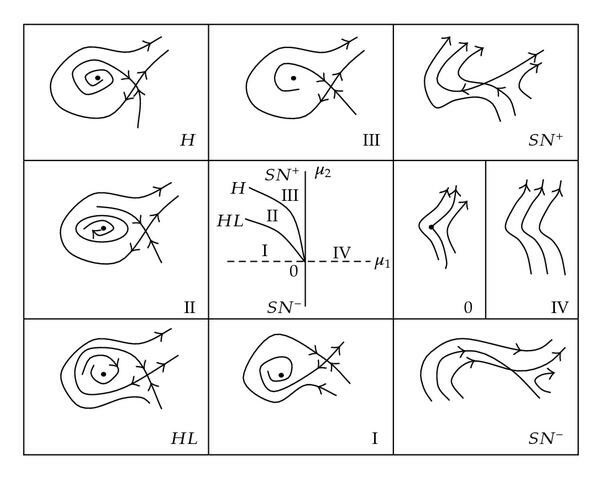 Static and dynamical bifurcations, including saddle-node bifurcation, Hopf bifurcation, homoclinic bifurcation, and bifurcation of cusp-type with codimension two (i.e., Bogdanov-Takens bifurcation), have been exhibited. Thus, besides the Allee effect, our model (1.6) shows that the viral oscillation behaviors can occur in the host based on the appropriate conditions, which was observed in chronic HBV or HCV carriers (see [29–31]). These results inform that the viral infection is very complex in the development of a better understanding of diseases. According to the analysis, we find that the cytopathic effect of virus and the birth rate of susceptible cells are both significant to induce the complex and interesting phenomena, which is helpful in the development of various drug therapy strategies against viral infection. This work is supported by the National Natural Science Fund of China (nos. 30770555 and 10571143), the Natural Science Foundation Project of CQ CSTC (2007BB5012), and the Science Fund of Third Military Medical University (06XG001).